The MicroLite.Extensions.Log4Net and MicroLite.Extensions.NLog packages have been replaced by MicroLite.Logging.Log4Net and MicroLite.Logging.NLog. The old packages have been updated to simply act as a redirect to the new ones so you shouldn’t be impacted by this change at all. However it would be worth while uninstalling the old package and installing the new one manually. The old packages are still listed (but hidden) so things like Package Restore will still work for you. The main reason for doing this is to get the logging extensions on a cleaner versioning and release process – the early builds were done before I fully understood the way nuget package dependencies worked therefore we ended up with new builds when we didn’t actually need them. In future, the packages will only be updated if there are breaking changes in MicroLite, Log4Net or NLog that they need to cater for. This entry was posted in Informational and tagged Logging, Release on January 13, 2014 by trev. We covered recently Extending MicroLite with custom Listeners and as a result you may find that you create a Listener that could be distributed for used by other people. Lets for example say that you created a Listener to perform validation and wanted to log any validation warnings and errors, you can utilise the logging abstraction provided by MicroLite. Now since we cannot guarantee that there will be a logger present, we don’t want to call log directly as it may be null. There are a set of extension methods available which will check whether a logger is in use and you should call them instead. They are in the MicroLite.Logging namespace so if you add a using for MicroLite.Logging instead of fully qualifying the ILog and LogManager class they will show up in intellisense. This example is to show you how you could log the warnings and errors (Validator and ValidationException are fictional classes used as an example). Firstly, add a static field to the class which is of type MicroLite.Logging.ILog which is resolved by the MicroLite LogManager class. 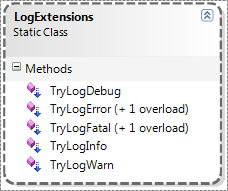 Then call the TryLog.. extension methods so that we don’t have to check explicitly whether we have a logger or not. This article was written for version 2.1.0 of the MicroLite framework. This entry was posted in Tutorial and tagged Extensions, Logging on November 22, 2012 by trev. As you will have seen in the Logging post, there are currently extension packages available to enable MicroLite to write to log4net or NLog. While these are the most popular logging frameworks, there are others available or you may use an in house logging solution. If you do not use log4net or NLog, you can easily create your own extension for logging. Start by creating a new class library project, the assembly naming convention used is MicroLite.Extensions.X where X is the functionality provider e.g. MicroLite.Extensions.Log4Net – log4net implementation of logging. Then create a class which implements the MicroLite.Logging.ILog interface, the log4net and NLog extensions simply wrap the logger in that framework and forward the method call. However, depending on the logging framework you are using, you may have to do more than that. // implement interface as required. Then, we need to add a class called ConfigurationExtensions in the MicroLite.Configuration namespace which extends IConfigureExtensions. The method name should describe the extension (e.g. WithLog4Net). The reason to put the class in the MicroLite.Configuration namespace is to make the extension visible without having to specify an additional namespace since the application startup will already be referencing MicroLite.Configuration. The IConfigureExtensions interface exposes a number of methods to integrate with MicroLite, however we are only interested in SetLogResolver at this time. As you can see from the method signature, it simply requires a delegate which can resolve a string into an implementation of the MicroLite.Logging.ILog interface. The code for the extensions is all open source and on GitHub if you want to see the full implementation details. This article was written for version 2.0.0 of the MicroLite framework. This entry was posted in Tutorial and tagged Extensions, Logging on November 5, 2012 by trev.